EDITOR’S NOTE: Read our review roundup of many of Aldi’s vegan Earth Grown products at this link. Aldi has several vegan options now, including these Regular Buy Earth Grown Vegan Meat Free Chickenless Patties. The product name caught our eye because it sounded sort of funny — these are chicken patties without the chicken — so my family decided to try these for dinner recently to see how they compare to regular chicken patties. 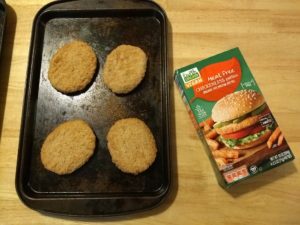 Aldi’s chickenless patties are actually breaded soy protein patties. They’re sold in the Regular Buy freezer section at Aldi, with four patties to a box. They are certified vegan through vegan.org. They also are cholesterol free and include 11 grams of protein per serving. One patty nets you 190 calories, .5 grams of saturated fat, 270 mg of sodium, and less than 1 gram of sugar. Ingredients are: water, breading (wheat flour, enriched wheat flour [wheat flour, niacin, reduced iron, thiamine mononitrate, riboflavin, folic acid], whole grain flour blend [amaranth, quinoa, millet, sorghum, teff], rice flour, salt, leavening [cream of tartar, sodium bicarbonate], sugar, yeast, sunflower oil, spices [including celery seed]), soy protein concentrate, textured wheat protein (wheat gluten, wheat starch, tetrapotassium pyrophosphate, sodium carbonate, mixed tocopherols), expeller pressed canola oil, wheat gluten, methyl cellulose, natural flavors, and isolated soy protein. You have four ways to prepare the chickenless patties: oven, toaster oven, skillet, or microwave. The oven is the preferred method, and this is how I prepared our chickenless patties. Preheat it to 450 degrees. Place the frozen patties on an ungreased baking pan and bake for approximately 8 minutes until browned. Carefully flip and bake an additional 8 minutes until heated through and well browned. To prepare in the toaster oven, preheat it on broil. Place frozen patties on an ungreased tray. Bake for approximately 8 minutes until browned. Carefully flip and cook and additional 7 minutes until heated through and well browned. To prepare in a skillet, preheat a non-stick pan over medium heat. Cook frozen patties until first side is browned, approximately 4 minutes. Carefully flip and cook for an additional 4 minutes. Continue cooking, flipping as necessary, until heated through and well browned. To prepare in the microwave, place on patty on a microwave-safe plate. Cook on high for approximately 45 seconds. Carefully flip and cook an additional 30 seconds. Patty should be hot throughout, but will not brown. These chickenless patties are not an exact imitation of a real chicken patty. They are more bland, and less salty. However, they brown nicely in the oven and are fairly crispy, and they are a reasonable substitute if you’re looking for a meatless patty that resembles chicken. My husband and kids happily ate their sandwiches. One of my daughters leans toward vegetarianism, and she liked knowing that no animals died to provide her with her meal. One child topped her patty with ketchup, mustard, and pickle chips. The rest of us ate our sandwiches with lettuce, tomato, pickles, and a squirt of Ranch dressing. Served alongside some fries and steamed veggies, these made a good family dinner. 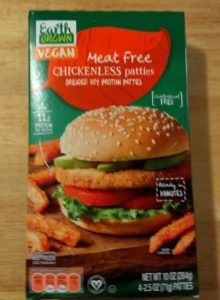 They are not exactly the same as regular chicken patties, but Aldi’s Regular Buy Earth Grown Vegan Meat Free Chickenless Patties — which are actually breaded soy patties — are a decent substitute if you’re looking for a vegan option.